The Hoya 52mm alpha Circular Polarizer Filter helps to reduce reflections and glare by filtering out light that has become polarized due to reflection from a non-metallic surface. The light from the sun naturally becomes partially polarized due to reflecting off electrons in air molecules, causing the light to scatter into what appears as haze. A polarizing filter arranges, and filters, this directionally polarized light perpendicularly to the reflected light, allowing for the absorption of much of this light. This results in a noticeable reduction of glare and reflections from non-metallic surfaces and an increase in the saturation of skies and foliage. This filter is non-coated and has approximately 96% average light transmission. It is constructed from optical glass and precision milled aluminum frames. Approximately 96% average light transmission. 3 to 4x filter factor reduces exposure by 1.6 to 2 stops. Constructed from optical glass and precision milled aluminum frames. 52mm alpha Circular Polarizer Filter is rated 4.6 out of 5 by 36. Rated 3 out of 5 by inanc from banding with some angles I have had this product for over a year, attached to my Sony Rx-100 IV. Looking back at the photos that I have taken I have noticed that it is causing some banding on the blue skies in certain angles. This happens very obviously when I am shooting from an airplane, but I suppose that could also be because of the double (and curved?) glass of the window. I havent tried that with other polarizers. That said, airplanes are not the only scenario, so just dropping my two cents here. Its OK for the price and can be used in most other scenarios, but I wouldnt rely on it for important photos. Rated 4 out of 5 by Sammy from 52mm Hoya Circular Polarizer Works OK The Hoya 52mm alpha Circular Polarizer Filter works ok, but I was hoping for a little more contrast at the peak position of the filter. I need to put in more time with the filter to determine how different lighting situations affect the filter, but for the price the filter is fine. Perhaps in the future I will spring for a more expensive Zeiss filter. Rated 4 out of 5 by uv10 from Easy to use I was first introduced to a polarizer by a professional photographer while on vacation. This filter works great if you like Black and White photography landscapes with black skies. You will need to learn how and when to use the filter. The position you choose to aim your camera in relation to the sun is important as the effect won't be very noticeable if you don't place yourself properly. Rated 4 out of 5 by Rui Pinto from Good Product Good product for the money. Not a super polarizer but ok. Rated 5 out of 5 by Belizeman01 from A real photographer aways has one ! This filter never comes off except at night.....that's how useful it is! Develope the habit to always give your filter a twist to see how the scene changes; the sky, the water, buildings, people's glasses, auto windows, and sport scenes.Whether color or B/W, it can cause a dramatic affect! Can't go wrong with a Hoya filter. Rated 4 out of 5 by Rob O. from Great for Outdoor Application I had been wanting to buy a polarizer for a long time. Hoya's prominence in the field made them an obvious choice after having less than stellar results with found optics. The difference was clear and immediate. The polarizer will darken skies and even out exposures of landscapes and outdoor shots easily. Rated 1 out of 5 by Miguel from Not a good polarizer filter I purchased this filter because I had heard that the company Hoya makes great Polarizer filters but they certainly weren't talking about this one. This filter has poor construction and constantly falls off the lens and it's very inconvenient when stacking other filters with this one. Also the polarizing effect isn't even that noticeable it's very slight and barely takes off reflections. Take it from me, you might want to skip this one. So you rotate it and the image gets darker? I do not know your meaning of 'darker', but YES you rotate it and you can see the effect that its produces. You could use the Hoya 52mm alpha Circular Polarizer Filter on any lens that has a 52mm filter thread, regardless if it is a Canon or Nikon lens. Hi! Does this filter fit on a pentax 35mm f2.4 lens? Because i donno the diameter of the lens.Thanks. Hello Swadeep,the 35mm f2.4 lens is 49mm diameter, unfortunately this will not fit since this filter is for 52mm. 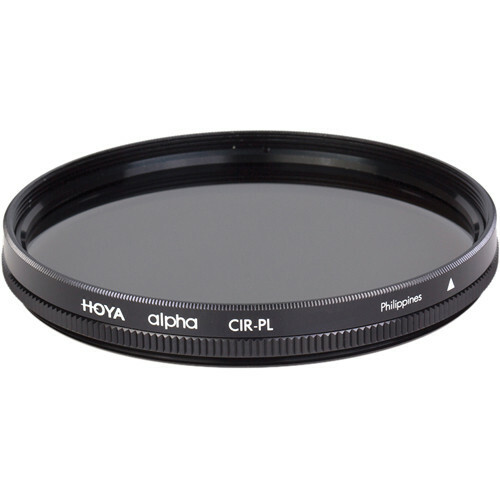 however you may consider this:&lt;a href= http://www.bhphotovideo.com/c/product/900343-REG/Hoya_calp49crpl_49mm_Alpha_Circular_Polarizer.html target= _blank &gt;http://www.bhphotovideo.com/c/product/900343-REG/Hoya_calp49crpl_49mm_Alpha_Circular_Polarizer.html&lt;/a&gt;best regards. Would this filter be good to use in a studio photography setting? I'm interested in using it for product photography involving reflections of flash on plastic and non-metal surfaces. Polarizer lenses will increase color saturation and reduce reflections. I recently purchased this filter from you. On the packaging it mentions digital and SLR and HDSLR underneath it. But I had not seen the word digital mentioned anywhere when I was researching the product on your page. Do you know if this filter can be used for digital and film photography? The filter can be used for film or digital photography. HDSLR means it's a digital camera that also captures HD video. Can I use a 52mm Lens hood and this filter together? Yes, this Circular Polarizer filter could be used on the lens with the lens hood together.